I grew up in the Pacific Northwest and you could grow rhubarb without even trying! So it’s no wonder that I grew up on family favorites like Rhubarb Crisp, Rhubarb sauce for topping over ice cream, waffles, toast and Strawberry Rhubarb Crumb Bars! But not this year! I finally figured out how to grow rhubarb in Arizona. 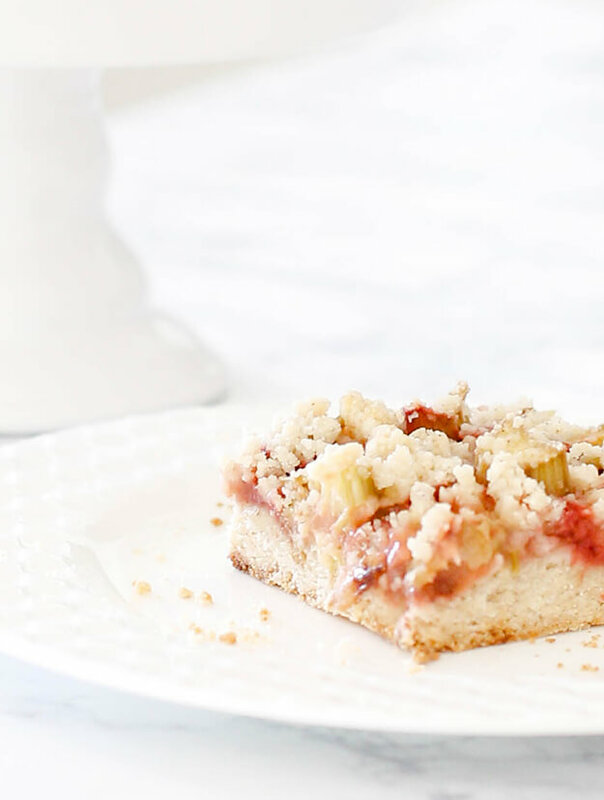 Now that I have a full supply of rhubarb in my own backyard and strawberries can be had for less than a buck, I decided to make one of my childhood favorites – this delicious strawberry rhubarb crumb bars recipe! They are like a cookie bottom, with a sweet filling and slight texture topping. I prefer to eat mine at room temperature or cool from the fridge. The hubs likes to heat his up and then add a big old scoop of vanilla ice cream. Either way, they are yummy! 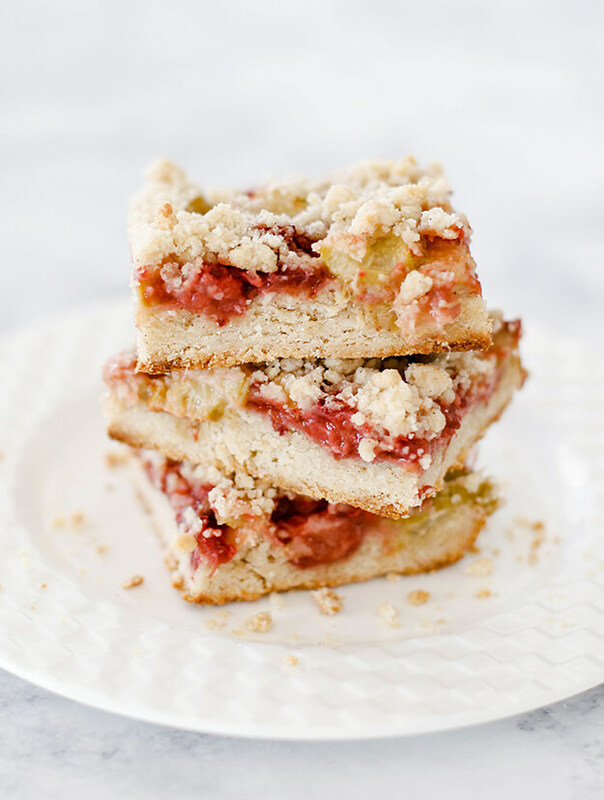 Plus these strawberry rhubarb crumb bars are really easy to make – yields about 18-24 bars – and is the perfect dessert to take to your next bbq or picnic outing! 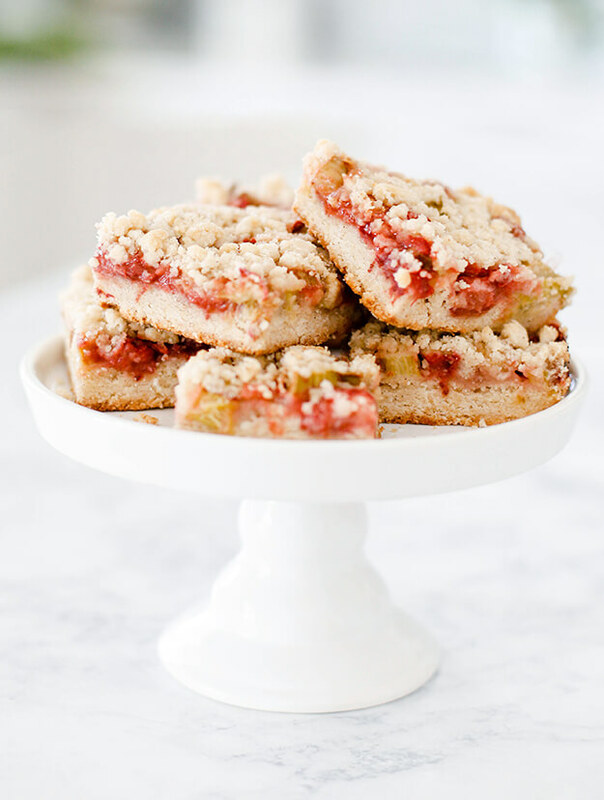 I hope you enjoy my family’s strawberry rhubarb crumb bars recipe! 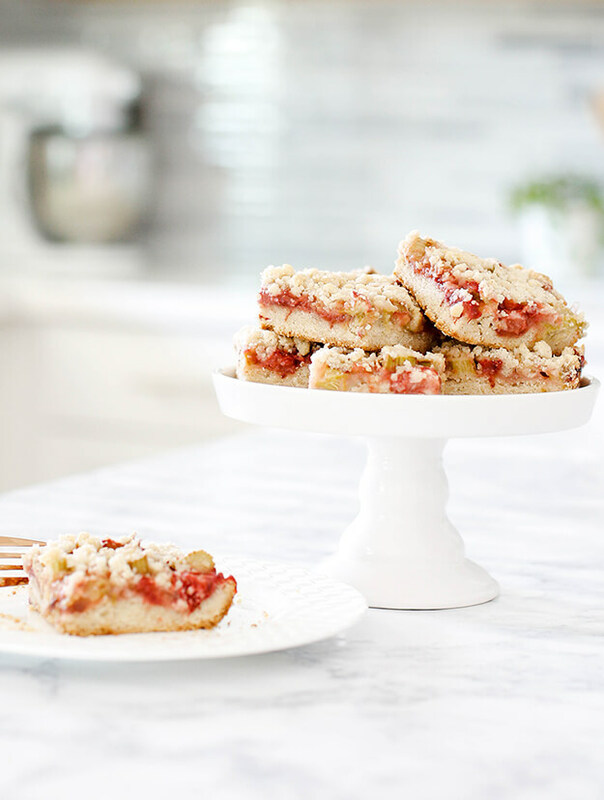 These Strawberry Rhubarb Crumb Bars are easy to make and a family favorite! Preheat the oven to 375°F. Spray a 9x13 inch pan with cooking spray. Line the pan with parchment paper, leaving 1 inch of extra parchment paper hanging over the sides. In a large bowl, combine the flour, sugar, baking powder, cinnamon, and salt. Cut the cold butter into ½ inch chunks over the dry ingredients. Using your fingers, squish the butter and dry ingredients together until the mixture is crumbly. In a small bowl, toss egg with a fork, then massage into the crumbly dry mixture with your hands. The dough will be crumbly. Scoop 1 cup of the crumbly mixture and set it aside. Place the remaining crumbly mixture into the bottom of the lined pan and press it down firmly with your hands, to form an even crust layer of dough at the bottom of the pan. In a large bowl, combine the rhubarb, strawberries, sugar, cornstarch and lemon juice. Gently mix it with a spatula. Spread the fruit filling evenly over the bottom crust. Sprinkle the reserved crumbly mixture over the fruit filling. Bake in the oven 40-45 minutes or until the top of the fruit is bubbling and the crumb topping is golden brown. Cool completely in the pan. Once the dessert has reached room temperature, use the 1 inch extra parchment paper to lift up and move the entire block carefully to a cutting board. Cut into bars. Serve at room temperature. Store in the refrigerator in an airtight container up to 3 days. I NEED this in my life! ? I can’t wait to try this! 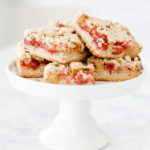 My 1st taste of Strawberry-Rhubarb yumminess was actually while on vacation in Seattle many years ago. I was just telling my husband a few weeks ago how good strawberry-rhubarb was since he’s never tasted it & that I wish we could get rhubarb here so I could try to make a pie. It never occurred to me to GROW it! Guess I’ll have to try now so I can make this. Thanks for sharing!